Burnley had suddenly got connections with Russia. Just under a year previously we'd hosted Dynamo Brest in a game that was played only eight days before Christmas Day and ahead of the 1991/92 season we travelled to what was then the Soviet Union where we played two games against Dynamo Stavropol and Asmeral. 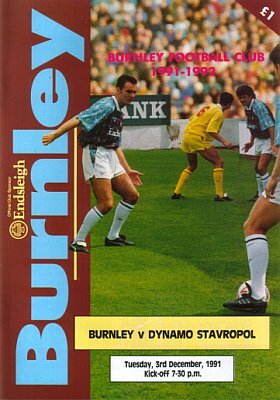 We'd built up a good relationship with Dynamo Stavropol and so, on Tuesday 3rd December 1991, we played them at Turf Moor in a game that struggled to capture the imagination of the supporters with not many more than 2,000 turning up at a Turf Moor which only had the cricket field and Bob Lord stands open. Those who did go got a goal treat with Burnley winning the game 4-3 and manager Jimmy Mullen showed the visitors great respect by making only two changes from the side that had won at Northampton on the previous Saturday, those of Chris Pearce coming in for Andy Marriott, who had returned to Nottingham Forest, and Graham Lancashire for Roger Eli although only four of the starting eleven finished the match. The Russians played in a different style to one that we were used to. They were technically excellent, had pace and passed and move the ball quickly. 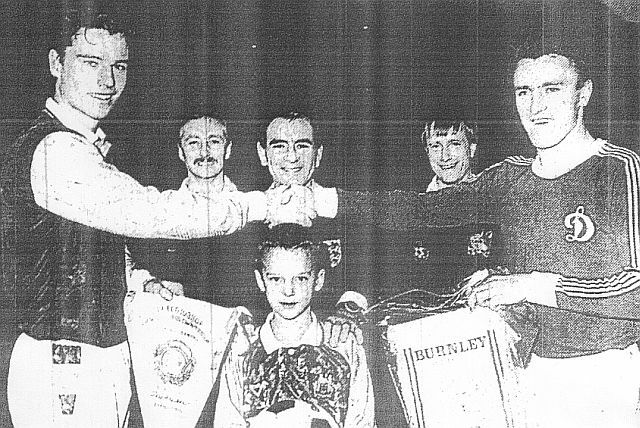 For a Burnley side who had been up against the likes of Northampton's Trevor Quow just three days earlier it was a big change. The first goal didn't arrive until the 39th minute. Burnley had been the better side although Stavropol had looked dangerous on the break. The goal came when Andy Farrell made a storming run upfield. He played a one-two with John Francis who then whipped in a great cross for Mike CONROY to power a header past Stavropol goalkeeper Vladimir Malahov. The lead lasted less than five minutes when a mistake at the back let in Leopald LEONIDOV to score from close range. It was 1-1 at half time and it had been entertaining stuff, but there was more to come in the second half. Just five minutes after the break we found ourselves behind for the first time when Albert ZARAEV scored with a brilliant solo goal, but what the Russians could do, so could Burnley, and three minutes later it was all square again as FRANCIS volleyed home an Eli cross. Both sides had held the lead and both sides had now equalised, and it was Burnley who edged in front for a second time when one of the substitutes, Danny SONNER brilliantly headed home after great work from Mark Yates and Steve Harper. One team taking the lead had been setting up the other for an equaliser and it happened again with Serguei CHESTAKOV giving Ian Walsh, now on in goal, absolutely no chance with a superb header. The game looked as though it could go either way but it was Burnley who won it with just 18 minutes to go when SONNER controlled a Harper cross with his chest before firing him in great style. The two teams received a standing ovation at the end after what had been a thoroughly entertaining game with the Clarets now set to prepare for an FA Cup tie against Rotherham four days later. Burnley: Chris Pearce (Ian Walsh 60), Ian Measham, Joe Jakub (Ian Bray 55), Steve Davis (Mark Monington 55), Mark Yates, Andy Farrell, Steve Harper, John Deary (David Hamilton 60), John Francis (Peter Mumby 68), Mike Conroy (Roger Eli 51), Graham Lancashire (Danny Sonner 51). Dynamo Stavropol: Malahov (Grunitcher 72), Papikian, Chestakov, Onafriev, Krasavin, Kostin, Osipian, Leonidov, Ossipov (Sanaja 80), Zaraev, Kopolov (Pobedenni 54).